It’s not that new – I just found an article about Storify, from almost exactly a year ago, on the website of the Poynter Institute, a journalism school in St. Petersburg, Florida. I wonder whether Berners-Lee and his colleagues dreamed it would ever become principally a tool of commerce; secondarily a way of perpetuating falsehoods, hate and insipidity; and third, a repository of most of the world’s exclamation marks (OMG!). The “pool of human knowledge” thingie has fallen somewhere much farther down the list. So, mea culpa, Toronto Star – this time. 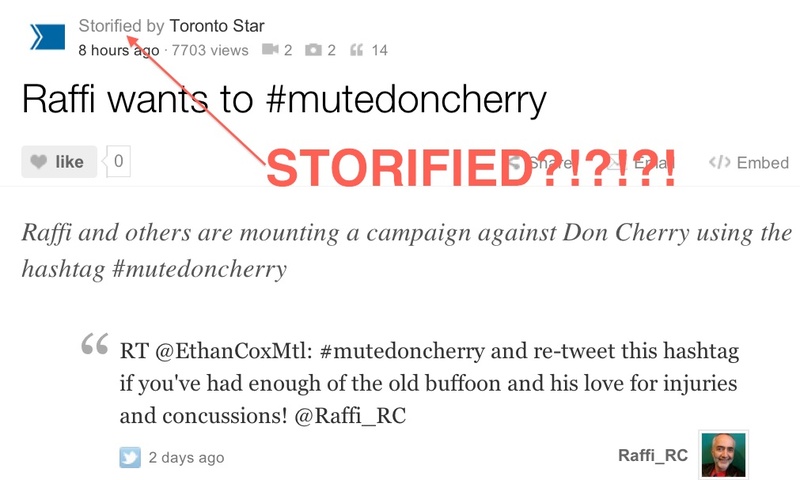 I guess you did legitimately Storify that… story. However, I plan to continue to resist adopting and perpetuating these wacko neologisms and meaningless buzzwords and catch phrases.